Where In The World Is VL OMNI Headed? 2018 has been quite the year for VL OMNI! The first half of 2018 was spent traveling across the UK for our well-received UK Roadshow, which took us to great Northern ecommerce powerhouse cities like Manchester, Leeds, and Newcastle, finishing off with a final event in London. From the UK, VL then made our way back across the pond to the first ever Shopify Meetup in Atlanta, where our CEO, Robin H. Smith, shared valuable insight as a part of a great and highly informative panel. A few weeks after Atlanta, Shopify Unite didn’t take us very far as it was hosted in our home city of Toronto, Ontario but was none the less a busy and exciting few days. While summer passed quickly, it was still as busy as ever for VL OMNI as we got our merchant customers ready for Back-t0-School, and Black Friday and Cyber Monday, all while embedding scalablility and agility into their back-end technology stack and integration strategy. Now with fall in full swing, VL is back on the road! Keep scrolling to find out where in the world VL is headed next! Fall 2018 will first take VL stateside to Los Angeles, California for an exclusive merchant only event on October 25th. 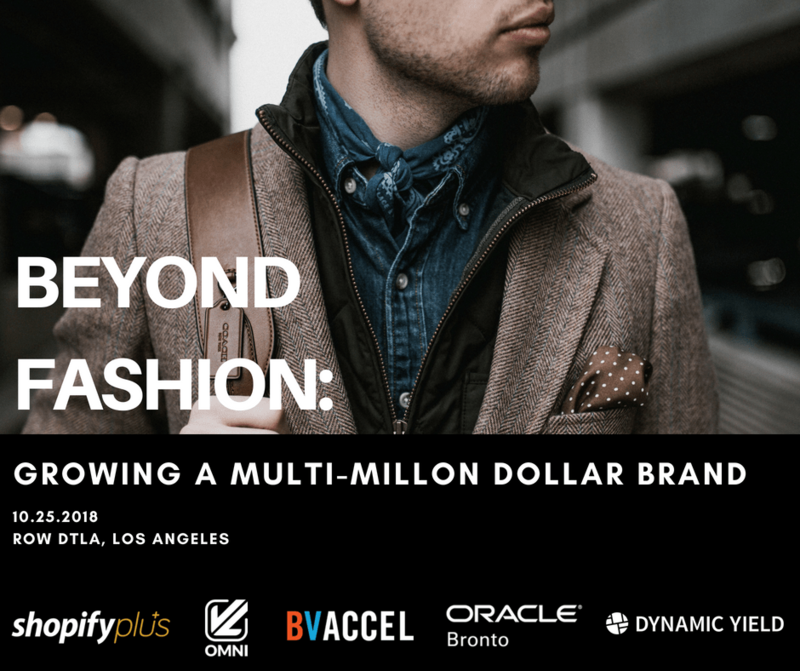 VL OMNI and BVAccel, in partnership with Oracle Bronto, Dynamic Yield, and Shopify Plus are proud to announce an invite-only merchant event that is tailored to elite high-growth Los Angeles fashion, beauty, apparel and cosmetic brands interested in learning from Merchants and official Partners in the Shopify Plus space. Invitees can expect two Q&A panels featuring top-tier Plus Partners and an AMA Merchant panel with multi-million dollar brands MVMT Watches, Thrive Causemetics and Varley. The entire evening will be centered on ecommece and omnichannel growth, how to manage and nurture it, and the challenges that come along with it. Are you a merchant interested in attending this event? Space is filling up quickly, so contact VL OMNI today for more information on the event! And we’re not done here, either! Stay tuned to VL OMNI’s blog to see where we’ll be next! INTERESTED IN JOINING US IN LOS ANGELES?